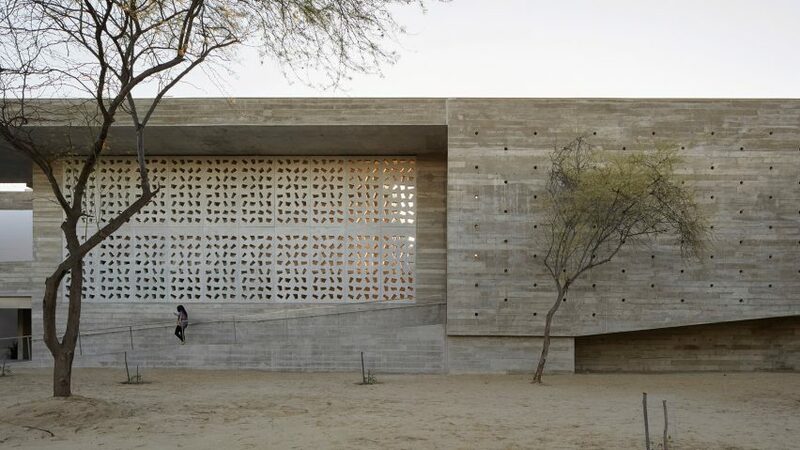 Architecture studio Barclay & Crousse has completed a wood-textured concrete university building in Peruvian city Piura. 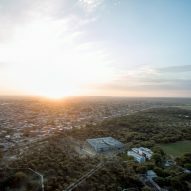 The Lima-based practice, which is led by Woman Architect of the Year Sandra Barclay and Jean Pierre Crousse, designed the building for the Universidad de Piura's campus, a 1,000 kilometres north of the Peruvian capital. The design responds to the arid climate of the Peruvian northern desert and is intended to provide comfortable spaces that promote interaction between users. 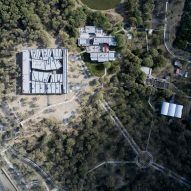 This was achieved by positioning the building's lecture halls, classrooms, group study rooms, faculty offices, administrative offices and cafeteria and reception hall, in a series of independent volumes connected by outdoor circulation. 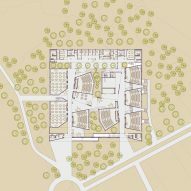 The overall plan of the building is a square measuring 70 metres on all sides. Within this geometric shape, the 11 various volumes feature angular surfaces that give each of them a unique character. 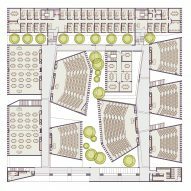 The volumes are sized and proportioned differently depending on the activities that take place within them, with the spaces in between containing courtyard gardens, shaded stairwells and corridors that introduce opportunities for impromptu encounters. 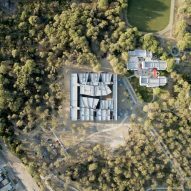 "The 11 buildings are arranged around a rational, square shaped circulation, and at the same time the spaces created between them are interstitial and labyrinthine, causing a series of unattended possibilities for gathering, resting and strolling," the studio said. "Our project had as a main goal to create a learning atmosphere more than an architectonic type or shape," the architects claimed," the studio continued. "We considered the building should be capable of nestling informal learning: casual encounters for exchanging ideas between students and between students and teachers, in a friendly environment." Cantilevered roofs topping the two- and three-storey volumes prevent direct sunlight overheating the various communal spaces, which include areas incorporating angular cast-concrete benches and tiered seating. 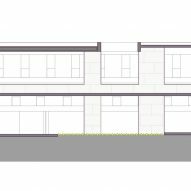 In places, gaps between the roofs allow glimpses of the sky, as well as ensuring natural light and ventilation reaches the spaces below. 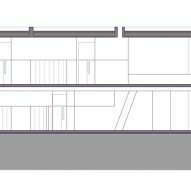 Large openings in the walls frame views towards the campus and create a constant shift in the perception of interior and exterior space. 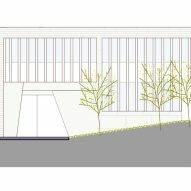 The facility's outer facades are entirely formed of cast concrete that lends it a monolithic aesthetic. Multiple openings incorporated into these surfaces facilitate movement through the building and create routes that can be used to navigate around the campus. 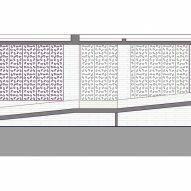 Depending on the orientation and the relationship with the surrounding nature, some of the elevations are lined with vertical louvres that let in plenty of light, while others incorporate prefabricated perforated blocks to allow dappled light to filter through. Peruvian practice Barclay & Crousse completed an archaeology museum at the entrance to the Paracas National Reserve. Earlier this year Barclay become the seventh recipient of the Woman Architect of the Year prize. Photography is by Cristobal Palma.